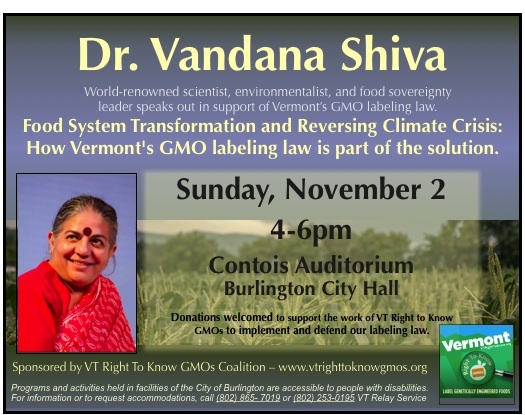 We are thrilled to be welcoming Dr. Vandana Shiva to Vermont for two speaking engagements next week in support of VT’s GMO labeling law. Her presentation is titled: Food System Transformation and Reversing the Climate Crisis: How Vermont’s GMO labeling law is part of the solution. Dr. Shiva will speak on Sunday, November 2, 2014, 4:00-6:00PM at the Contois Auditorium in Burlington’s City Hall, 149 Church Street. This event will be livestreamed at this link beginning at 3:55. Dr. Shiva will also speak at the Vermont Law School on Monday Nov. 3 at 5:00PM in the Chase Center. This event is sponsored by the VLS Center for Agriculture and Food Systems. Both events are open to the public, and donations will be welcomed to support the ongoing work of the Vermont Right to Know GMOs Coalition to implement and defend Vermont’s GMO food labeling law. Dr. Shiva’s visit to Vermont is being facilitated and co-sponsored by the Vermont Right to Know GMOs Coalition which is a partnership of Cedar Circle Farm & Education Center, NOFA-VT, Rural Vermont and VPIRG. Join the Right to Know Roadshow! We are at a critical stage in the two-year effort to pass legislation requiring foods made with genetic engineering to be labeled in Vermont. After passing the Vermont House last year and the Senate Agriculture Committee last month, our GMO labeling bill, H.112, will now be considered by the Senate Judiciary Committee in mid-March. If approved there, it will move to the full Senate for a vote and, hopefully, straight to the Governor’s desk for his signature later this spring. This steady success has been due to the continuing engagement of tens of thousands of Vermonters, who have let their legislators know that they care about where our food comes from, how it is made, and what it contains. Want to learn more & get engaged? Over the next few weeks members of the VT Right to Know GMOs Coalition, including NOFA Vermont, will be be hosting a series of consumer education workshops around Vermont. These are sponsored by community co-ops in different regions of the state so that you will have the facts you need to help H.112 become law. We will also be showing the highly-regarded film GMO OMG in six locations across Vermont. Please plan to join your neighbors at one or more of these events – we need everyone to get this job done! Show your support for GMO labeling on January 16! Vermont GMO labeling bill (H.112), which passed the VT House last May by a wide margin, is now being debated in the Vermont Senate. H.112 would require that foods made with genetically engineered (GMO) substances be labeled as such. Success in the House — in the face of well-financed opposition by a number of global chemical and food corporations — was due to thousands of Vermonters who contacted their representatives and told them — loudly and clearly — to support H.112. As in the House, passage of H.112 in the Senate and final enactment into law, will require thousands of Vermonters to let their voices be heard by their Senators and in their communities. The opposition’s lobbyists and PR people are already at work in the Statehouse. They are is determined to kill this legislation — no matter the cost. Join us for a Vermont Right to Know GMOs rally at the Statehouse on 1/16! Now is the time for Vermonters, once again, to let their voices be heard in their Statehouse and by their elected Senators. On January 16, the Vermont Right To Know GMOs coalition, of which NOFA is a member, will be holding A GMO Rally, Teach-in and Lobby Day at the Vermont Statehouse. At this event you will learn more about the issues and how to make sure your voice is heard in the Statehouse by your Senators. Full information about Lobby Day agenda can be found on the Vermont Right To Know GMOs webpage. Scores of Vermonters have already registered to attend. We hope that you and your neighbors and friends will be able to join us. Let’s show ’em how democracy ‘gets done’ in this little state. During the debate leading up to the historic vote that passed Vermont’s GMO labeling bill out of the House, we heard statements from many representatives. At NOFA, we felt that one of the most thoughtful and thought-provoking came from Will Stevens. Will is co-owner of Golden Russet Farm, a certified organic vegetable & greenhouse operation in Shoreham, VT, and is now in his 32nd year of commercial production. He has been a NOFA-VT member for about that long, and is a past President of VOF. He is currently in his fourth term serving as an Independent member of the VT House of Representatives, and is on the Agriculture & Forest Products Committee. Is this not the “People’s House?” Whose interests are we serving when we oppose the public’s right to know? House approves GMO labeling bill! We’re proud to announce that the VT House of Representatives has passed H.112, the GMO labeling bill. Stay tuned for an in-depth post on the bills history and next steps soon.